I'm very sorry for having to cancel the book chat last week. It was just one of those weeks when I needed a time-out to regroup. Things are much better this week. I'm starting to feel more comfortable and really feeling at home. Okay, I know I wasn't the only little girl who watched Beauty and the Beast and was totally in love with that library he gave her. They taught us young, love a man who gives you a room full of books. Ever since that first scene when she sings on the library ladder, I have always wanted a book shelf with a ladder. If you have so many books that you need a ladder to reach them, you must be doing something right. Someday, I will have my own personal library. Someday. However...for now we are living in Cozy (the adorable apartment needed a name). To be honest, I'm actually having more fun decorating a small space rather than a large space. It's not so intimidating. Large spaces scare me. One of things I'm worried about though is what to do with all of my books. We don't have a ton of extra wall space to put big book cases on. (No ladder book shelves here) So, we're having to get creative with our organization. I've been scouring design books and blogs and coming up with fun ideas. This adds such a cozy feeling to the room, doesn't it? Why have I never thought of this? I'm more free-spirited than my husband. I have a feeling this would bother him, but I kinda dig it. It makes the books look like they're actually read and not hidden away in the corner. Can we say book shelf envy? This would be great, but I have no clue how to install something like this. But it would be lovely, wouldn't it? I love this couple's tips on Styling a Bookshelf. They don't have a ton of books on the shelf, but I really love the idea of putting more than books on the book shelf. I tend to over-fill my book shelves. If I only put a handful of books on each book shelf, let's be real, I'd need about a hundred book shelves. (Wouldn't we all?) But I love their tips on placing some items horizontal and some vertical. In their book, they mention taking the book sleeves off and showing off the bare spine. Why didn't I think of that! That's why they're my favorite design blog. Books make for great decor. They're functional, entertaining and make your space look great. I love the look of a room full of books. I want a room literally spilling with books. Walls covered with them. Books on the floor and on chairs and tables. Books on the windowsill and in the kitchen. Throw in that library smell and call it home. What about you? What does your dream book shelf look like? Or do you have a book shelf you want to show off? Any tips for this small-space first-timer? Link up with me. I chose not to include a co-host this week. My internet connection has been, in a word, unreliable. I didn't want to promise someone the spot, then never come through with details. I'm with your husband on this one. I don't think I could deal with books on the floor! At least not for a long time. It does look neat on the picture, but I'm very particular with the organisation of the house. You should talk to My husband though, haha! 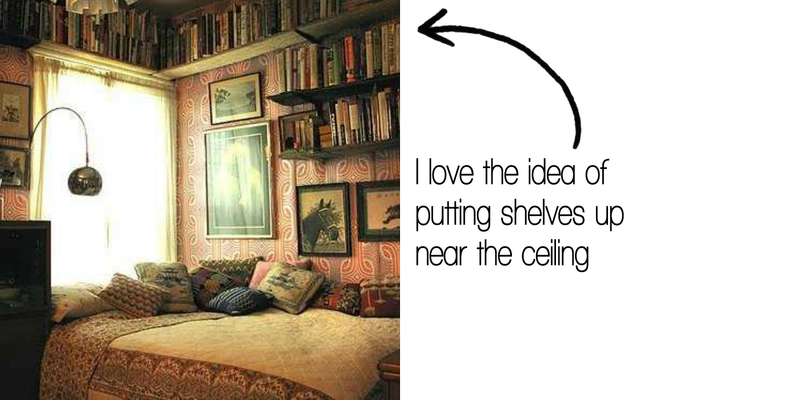 Omg, I love the bookshelf near the ceiling! 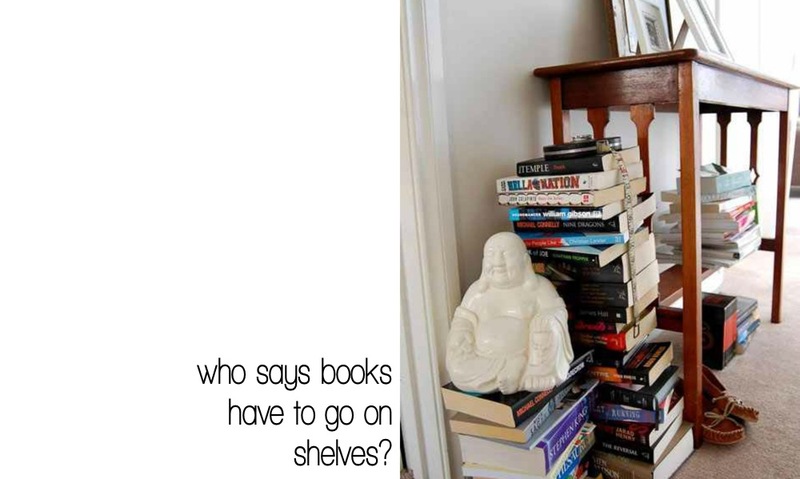 I actually have a shelf like that in my daughters' room, and I never would have thought to put books up there. I think I may have to, now! 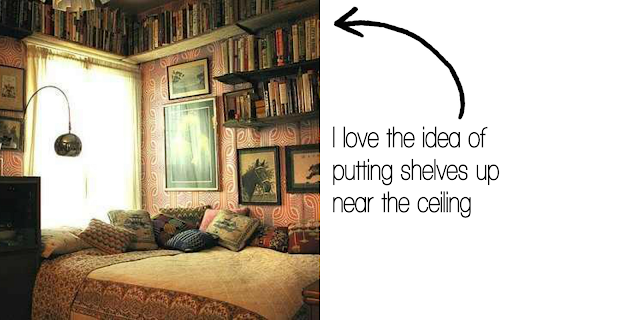 I love those bookshelves right by the ceiling, but I'd be so scared they would fall on me LOL! I also love those floor to ceiling ones. They remind me of Beauty & The Beast... I always wanted a big library like that! This was such a fun topic! I felt the same way when I watched Beauty & the Beast, this was such a dream library. 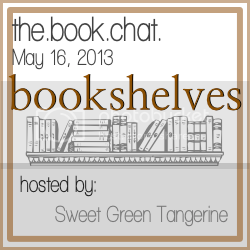 I just stumbled on your blog and I love this book chat idea..... I am all set for this week but I´d love to link-up for next weeks cookbook topic. That sounds lovely! I don't have a blog anymore BUT I absolutely loved the library in Beauty & The Beast. I hope to have one of my own in my future home!! My bookshelf at home is already full. Might need to invest in another one! LOVE this post! I would be really happy with any of these because BOOKS. 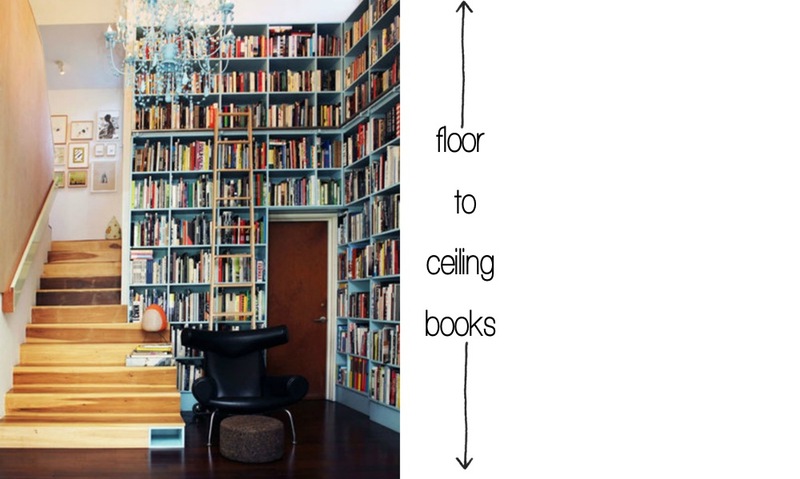 I def would like floor to ceiling bookshelves!